The Regency Chess Company has become very firmly established in the UK and Europe since our creation in 2008. 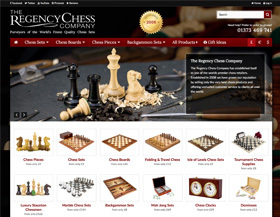 New for 2018 is our launch in the USA market with a brand new website Regency Chess USA. The new website features a selection of our mid range and luxury chess and backgammon sets. As our E-Commerce Channel Manager, you will be responsible for growing our sales through optimising existing sales channels, opening new channels, managing partner-website relationships, active marketing and maintaining our published online content. The role is very varied including SEO, social media (FB, Instagram etc. ), website content writing, project management, graphic design and video editing. The theme for the fifth wedding anniversary gift is wood. I know if you're like me then you often rack your mind for hours trying to think of the ultimate wedding anniversary gift. You want something that has a good wow factor, something that shows you thought about it, and something that is going to last and create a long loving memory. If you're buying a gift for him then a Luxury or mid range wooden chess, backgammon or mah jong set is the ideal present. We are often asked, what is your coolest chess set. It's a difficult question to answer, we have hundreds of products on our chess retail website and it's sometimes hard to determine which ones stand out as being particularly cool. Below is a list of our top three coolest chess sets (in our humble opinion). Chess and Cuba have a long history, one that began with the Spanish colonisation of the island from the late 15th century – at a time when chess took on the general form we know today – and has remained constant in Cuban life. In Katwe, Uganda, two children sit restlessly on a bench, watching their peers play a game of football. Their coach, Robert Katende, spots their reticence, and offers them an alternative. "There is another game you can play." he suggests. He refers to a board-game – chess. At first, the boys scoff at the suggestion – they’re not interested. That is until Katende describes an anecdote in which he defeated his more privileged peers at university. Let your creative juices flow! A fantastic opportunity has arisen for a Digital Marketing Technician at JDS Toys & Games Ltd based in Frome. Your core skills in Photoshop, combined with your eye for a good marketing stance will be integral to pushing this thriving, leading deluxe chess and backgammon retailer into it’s next growth phase. Chess Apps – How Functional Are They? We live in a culture of apps. Without apps, our smartphones, albeit powerful devices, would be stripped to the bare minimum. Even texting is an application! The ability to utilise third-party software on your phone is what makes it an extraordinary utility. Once, you were limited to the applications your phone provided, but not anymore; now, we have the luxury of choice, an essential component to customer experience So, whilst it’s certainly true to say we live in a “culture of apps”, it might be more appropriate, and accurate, to say we live in the ‘age of customisation’. Regency Chess has a chance encounter – How good are board game cafes? Last week we paid a visit to a newly opened café in Bristol, Chance & Counters – the first café in Bristol to cater exclusively to board games, created by friends Richard Scarsbrook, Steve Cownie, Alex Ratcliffe and Luke Neal. It’s our intention here at Regency Chess to really reach out to the growing number of establishments that are providing a home for chess, and board games more broadly, within the cosy, vibrant environments of cafés and bars.